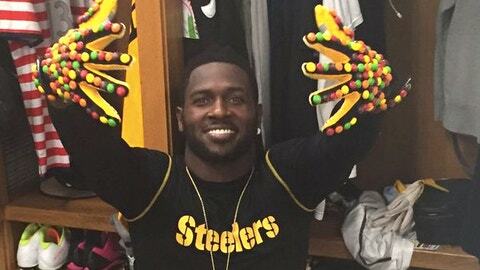 Antonio Brown really likes Skittles. Not as much as Marshawn Lynch, probably, but he’s a huge fan of the rainbow-colored candy. He’s received a whole bunch of Skittles-inspired products in the past, including dancing shoes, a jacket and even receiver gloves. His latest gift from the company is by far the best, however. Skittles sent Brown a custom vending machine for his house with his slogan “Business is Booming” and his signature on it. The present had Brown dancing, which is completely understandable because he now has a vending machine in his home. Business is indeed booming for Mr. Brown.